Recently we came across some rumors that Apple might be looking to hit the Chinese market with a dual-SIM version of the iPhone 8. We've seen such rumors prior to the launch of the iPhone 7 too, but they proved to be untrue. This is why we dismissed the new speculations entirely, without looking to much into them. We might have been wrong to do so, though, as the database of the United States Patent and Trademark Office (USPTO) now contains a patent, granted to Apple, for a dual-SIM technology with two separate antennas. The patent details the technology used to work with two SIM cards, and how to determine the priority between them. According to the description, the card that's actively used for a call will have the priority over the one that's used for data at the same time, which is perfectly normal. We don't want our calls cut short, just so we can receive a Candy Crush invite. Some embodiments, detailed in the description, support LTE networks, which is to be expected for a flagship device, so having two SIMs won't compromise connectivity options at all. 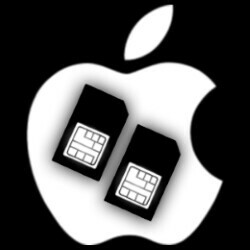 It is important to note that this is merely a patent and it doesn't confirm any dual-SIM iPhone rumors. Apple may or may not use this technology in future devices, but after this one, we'll keep our eyes open for more info on a dual-SIM iPhone.